Chinese companies appear to be getting the hint that U.S. regulators are worried about Chinese encroachment into valuable U.S. intellectual property. Cross-border mergers involving acquirers in China and targets in the U.S. fell sharply in the first quarter of this year amid gloomy regulatory signals from Washington. Chinese acquirers announced deals for U.S. targets totaling $492.5 million by value in January through March, according to Bloomberg Law’s Quarterly Cross-Border M&A Market Update. That’s a 59 percent drop from $1.2 billion in Chinese inbound investments in the fourth quarter of 2017. The decline is due in part to Washington’s increased scrutiny of Chinese investments, according to analysts. Broadcom Ltd.’s bid for Qualcomm Inc. is among high-profile Chinese deals that have collapsed amid U.S. concerns under President Donald Trump. The Committee on Foreign Investment in the U.S. (CFIUS), a multiagency panel that reviews cross-border deals for their impact on national security, would be expanded under legislation that’s moving quickly through Congress, with bipartisan support. “It’s not surprising at all that we’re seeing a slowdown,” Mark Ostrau, chair of the antitrust and trade regulation group at Fenwick & West LLP, told Bloomberg Law. Chinese companies are hesitant to invest in certain U.S. sectors because of the CFIUS risk, according to John Scannapieco, a global trade attorney who specializes in foreign investment matters at Baker Donelson in Nashville, Tenn.
“Either they do not believe they can get the transaction approved or simply do not want to deal with the uncertainty and the hassles associated with addressing any potential CFIUS issues,” Scannapieco told Bloomberg Law. The deal volume has also been affected by increased restrictions in China, he said. The Chinese government has taken steps since 2016 to tighten controls on money leaving the country and to boost its own industries. 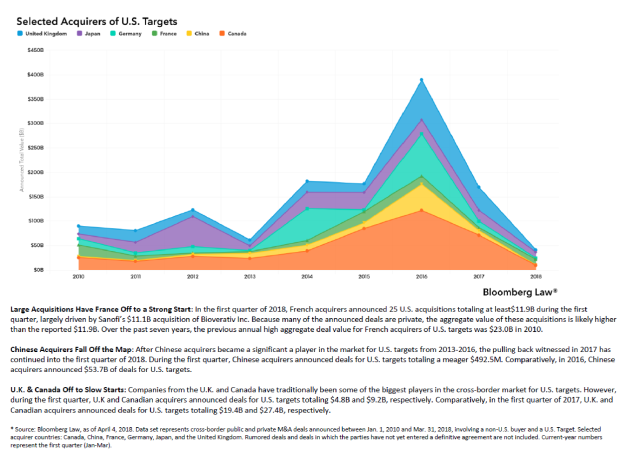 China was a significant player in the market for U.S. targets from 2013 to 2016, but that’s shifting dramatically, according to the Bloomberg Law data. The aggregate value of Chinese bids for U.S. companies totaled $53.7 billion in 2016. The total fell to $9 billion in 2017. Members of Congress and the Trump administration have flagged investments from China as a growing national security threat. They’re particularly worried about technology-related investments that could be used to bolster China’s military capabilities. Legislation approved by the Senate Banking Committee and House Financial Services Committee on May 22 would strengthen CFIUS. Senate Majority Whip John Cornyn (R-Texas), lead sponsor of the Senate version, is among top lawmakers who are pushing to get the legislation enacted this year.